MULTI-TALENTED TINA DICO SEEMS DETERMINED to make her mark as she puts all she's got into her poetic, gritty, raw-edged album Count To Ten  and just when you think she's given it her all, this free spirit hits you hard with both barrels. Best known for her collaboration with Zero 7, Tina Dico hails from Denmark and the singer-songwriter's stunning new album will be out on Finest Gramophone on February 4 (2008). Produced by Tina and long-term associate Dennis "Ghettoblast" Ahlgren, Count To Ten follows her critically-acclaimed album In The Red. Count To Ten is a lavish collection of emotive, potent songs delivered with Tina's trademark soft yet powerful voice. Heavy influences sneak in from the likes of Donovan, Leonard Cohen and Radiohead  just like her idols, this is one 29-year-old who has a fine ear for melody and a real love of poetry. make sense to me then". In essence, it reminds me a little of Leonard Cohen's The Stranger Song, although not quite so profound. Tina's voice resonates delightfully as she sings the track On The Run and the ballady, strung-out Open Wide gives way to the pretty melody of Night Cab; through to the gentle beat of Sacre Coeur, where you can imagine you are following in the steps of Tina, in Paris. I also loved the tweaky-twang of the talk-song My Business. Not surprisingly, Tina is keen to keep up the momentum. The first single to be lifted from the album is the haunting, beautiful and evocative melody Sacre Coeur, also to be released on February 4 (2008). Tina is best known in the UK as the voice on top Zero 7 tracks Home and The Space Between, both of which were lauded as modern reboots of Joni Mitchell's Sunshine Folk. She set off around the world with the elec-tronic duo, playing the enormo-domes of both the UK and the US and gathering a steady fan-base along the way. In her native Denmark, Tina impressively pipped Coldplay and U2 to the post at Number 1 spot and she has won the Best Songwriter Grammy and been voted Best Composer at the Danish Music Critics Awards. The remarkable thing is that this uniquely-clever young lady has accomplished so much by putting out her music herself  without recourse to the marketing muscles of A Big Record Company. In an age of gimmicks and payola, text-in talent contests and image-first/music-second rock posturing, Tina Dico did it her way  on the strength of her songs. She is rather modest when she says: "I guess it is quite unusual to start your own label when you're 23 and release your own album in the 'States when you're 27. It goes to show you what you can achieve." 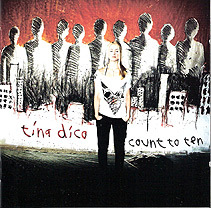  Tina Dico's album Count To Ten will be released on February 4 (2008) and the single from the album, Sacre Coeur, is out  download only  on the same day. My Business | Cruel To The Sensitive Kind | Everybody Knows (Night Cab Epilogue). Check out tinadico.com and myspace.com/tinadico.